Um eventuelle Schäden am Instrument zu vermeiden, wird empfohlen die Montage des „String Butler®“ von einem Fachmann ausführen zu lassen. Um eine optimale Wirkung des „String Butler“ nach der Montage zu gewährleisten, sollten die benutzten Gitarrensaiten entfernt und ein neuer Satz Gitarrensaiten verwendet werden. Alle „String Butler“ Modelle werden zum Schutz des Lackes vor Abdrücken und Kratzern mit zwei PVC Unterlegscheiben geliefert (ausgenommen davon sind die String Butler acrylic“ Modelle). Diese PVC Scheiben werden über die Stimmwirbel gesteckt und unter dem „String Butler“ platziert, wodurch eine ausreichende Distanz zur Kopfplatte erreicht wird. Überprüfe anhand der Maße auf den Abbildungen die erforderlichen Abständer der Mechaniken zueinander. Überzeuge dich vor dem Kauf eines der „String Butler“ Modelle, ob die Mechaniken deiner Gitarre für eine Montage geeignet sind. 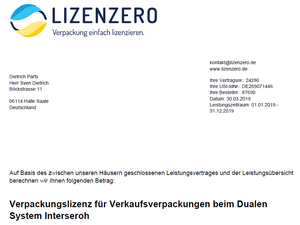 Nicht kompatibel sind Mechaniken mit Einschlaghülsen / Steckhülsen die z.B. bei „Vintage Nickel Mechanik“ Serien verwendet werden. The smallest distance of the guitar tuner is 35.0mm. The string Butler V3 fits. This happens when the machine heads are positioned in a specific arrangement wherein the strings are kinked behind the nut. Bending a kinked string pulls the kink into the nut where it gets stuck until it’s pulled out again by tuning. If you tune your guitar at this point you can hear a “pling” sound. The “STRING BUTLER” takes the strings out of the nut in a straight line and guides them over a set of wheels into the machine heads. 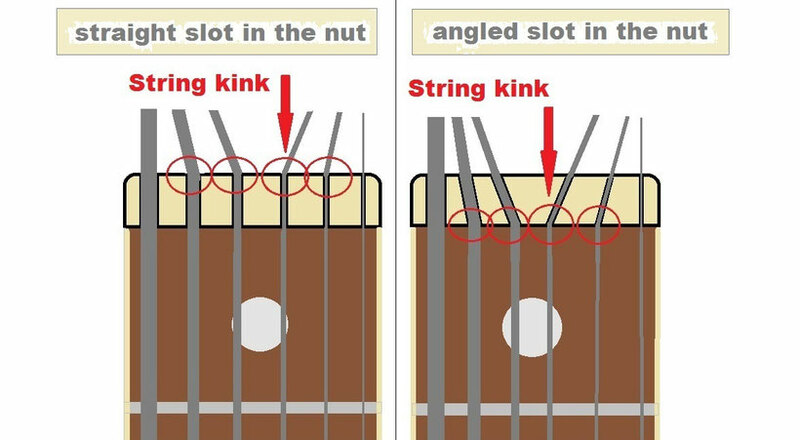 Because of that, the strings cannot kink behind the nut. 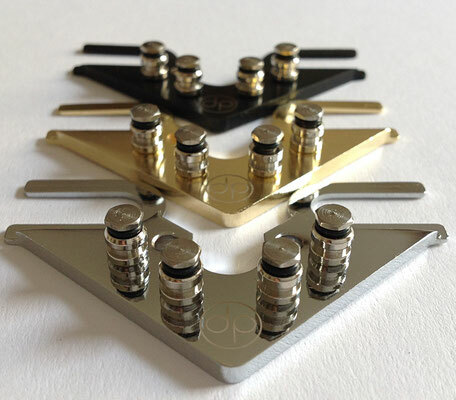 It does not matter how expensive the machine heads of a guitar are. 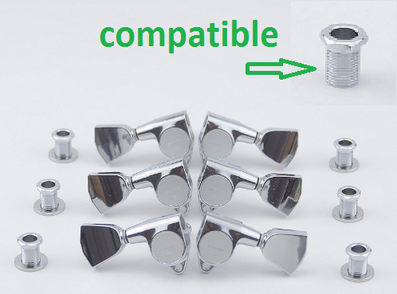 It is important how the strings move between the nut and the machine heads. 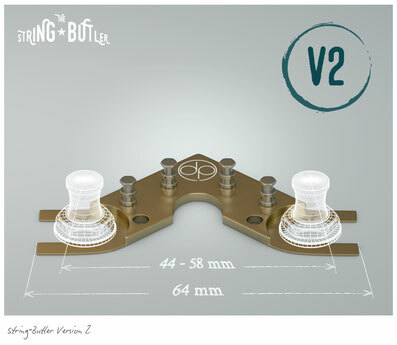 The “STRING BUTLER” has been designed exclusively for guitars fitted with a headstock with a 3L / 3R tuning machine head layout. 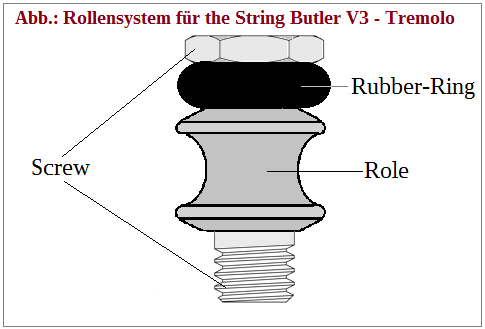 Importantly, the “STRING BUTLER” has been designed for tuning machines fastened with threaded screws. 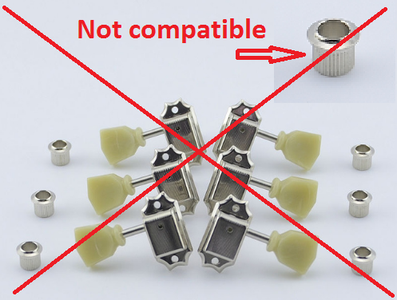 Vintage Keystone style tuners with sleeves to strike are not compatible. 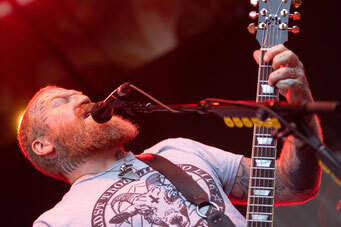 Good examples are Les Paul type guitars. When assembling the “STRING BUTLER” it is important to remove the old set of strings and clean the nut well.Next, use a 10mm wrench to unscrew the machine heads, a 3/8" wrench may not work. 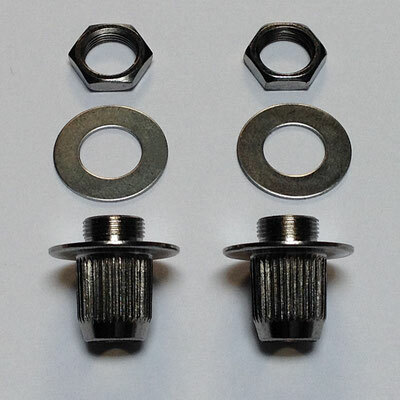 There are tuners that require omitting their washers, but if the pegs are long enough you can continue to use them to secure the “STRING BUTLER.” Be careful not to tighten the thread nuts too firmly to prevent damage. Guitar Machine Heads Type "Locking" can not be used when the distance from the head plate to the hole for the insertion of the guitar strings is 19.5 mm or less. 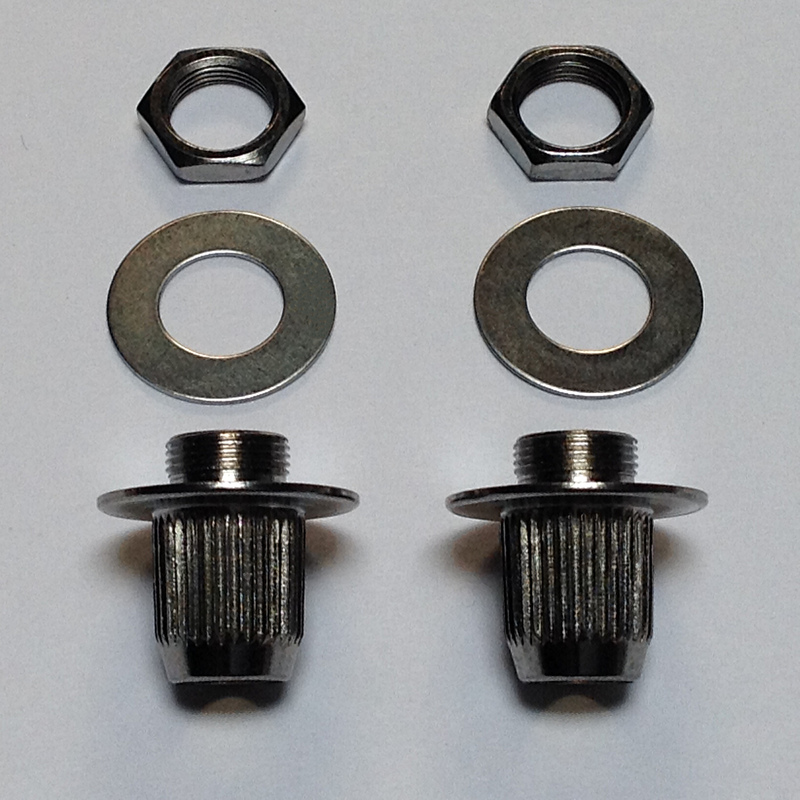 Optimal is 21.5 (without flat washer) to 24.0mm (with flat washer) if the head plate is not stronger than 15.0mm. 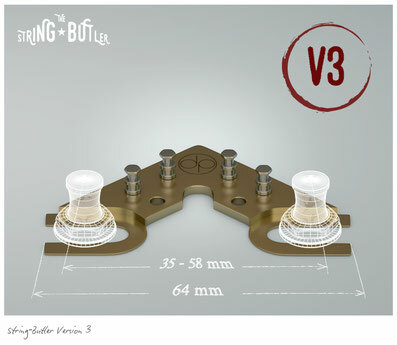 Compatibility Kit specially designed for attaching the String Butler® to guitars with vintage tuners.
! Not compatible with String Butler® Acrylic model V2 & V3 ! This kit is not for Gibson® guitars! 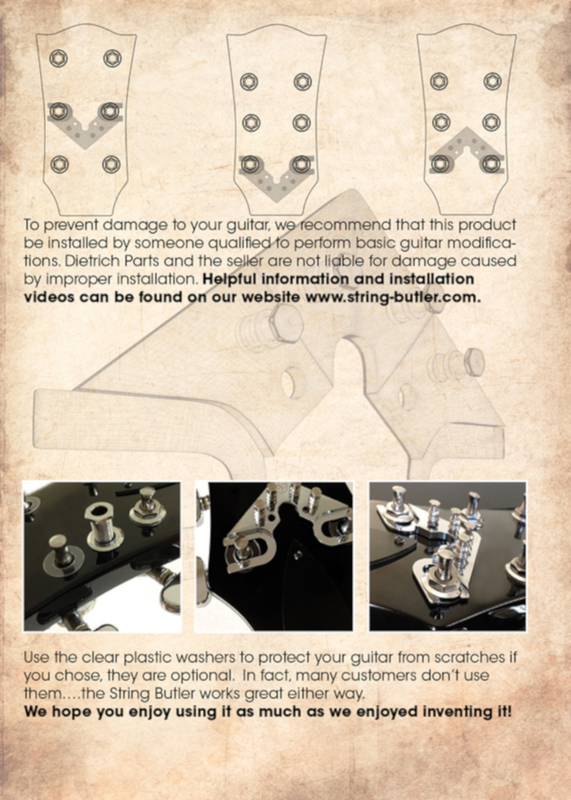 For Gibson® guitars you need the String Butler® Vintage Adapter Kit 2 (SB-VAK-2) ! 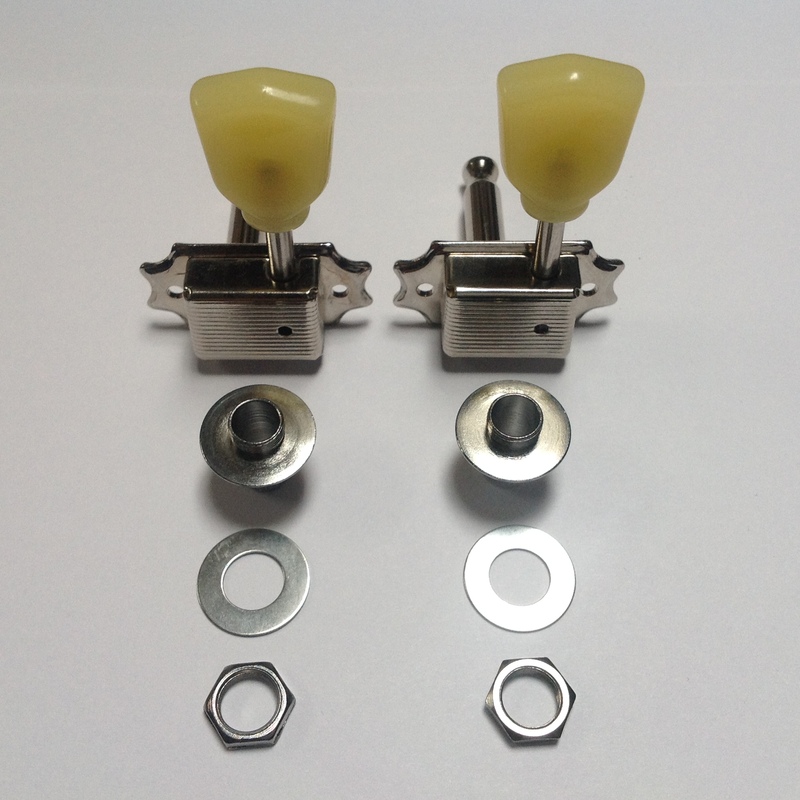 - let the original vintage impact sleeves removed by a specialist ! Gibson ® guitars with vintage tuners. - first remove all 6 strings of the guitar completely! 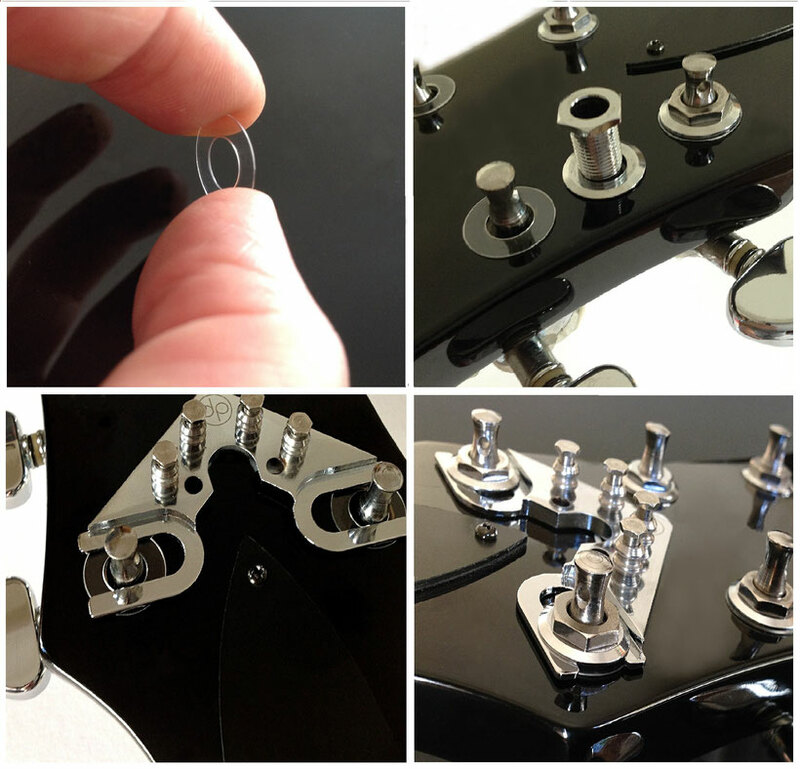 - just remove the E-strings tuners from the headstock and keep screws have original vintage impact sleeves removed by a specialist and replace with new Dietrich Parts threaded sleeve. then put on new set of strings - guitar tune - done.